This site has now become a memorial to my lovely wife Sarah, who passed away on 17th June 2010. 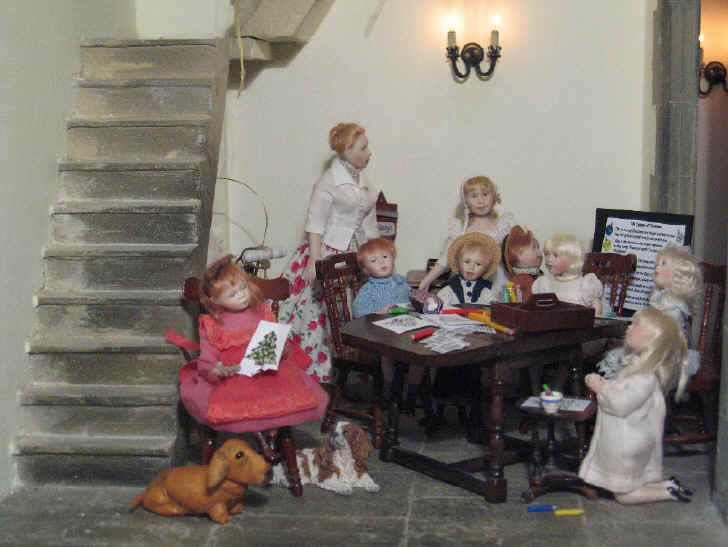 As our readers will already know, she set this up in memory of her mother Hilary Davies and needless to say it has grown over the years and speaks a great deal to Sarah's own indomitable spirit and creative imagination. Please read through each page and continue to enjoy what she has written. The Children enjoy their Advent lessons on Christmas Colours! Miss Esther and Alice have been VERY busy preparing for this Advent lesson for the Sunday School children! 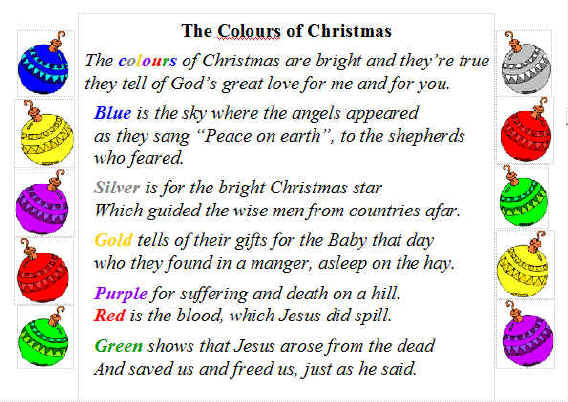 Alice has had Miss Webb's "Colours of Christmas" poem printed out very large in order to pin it to the blackboard. She has also printed out two of the Christmas tree templates for the children to colour in after the vicar has given them a talk about the significance of the colours purple and blue. .....it is none other than young Robert Alexander! He was very proud of himself as he was the first child to arrive at church! 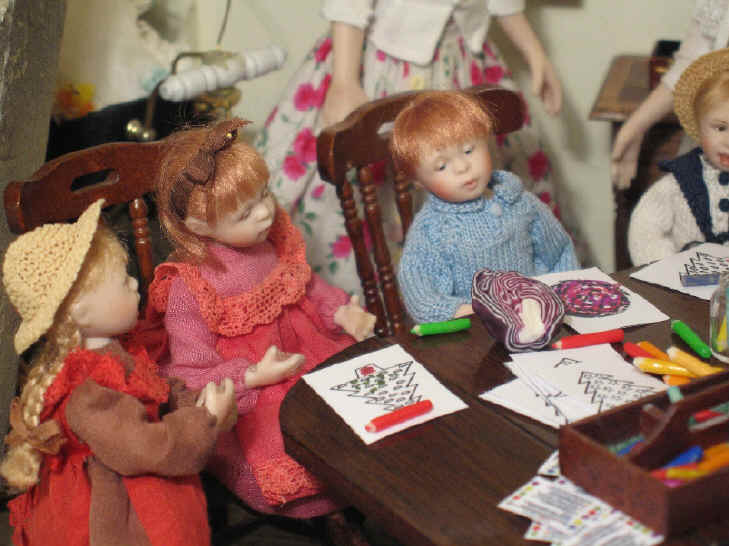 You see, the week before Miss Esther was asking all the children, by way of preparation for this lesson, to find out something about the colours purple and blue. Robert Alexander thought he was SO clever because he had noticed these purple cabbages on one of the market stalls when he and his mother were out shopping. He HAD to bring it along to the Sunday School for this lesson on Advent and the colours blue and purple! And.....would you believe it but he has even given his cabbage a name.......Charles! What a royal name for a purple cabbage! We are not sure what our Prince Charles, heir to the British throne, would think though......if only he knew?! How many animals and birds can you count here? All the church pets and wildlife were al SO excited about this lesson that they HAD to attend too! Esme, the local Mallard duck, was keen to see better so she decided to perch on the kneeler. 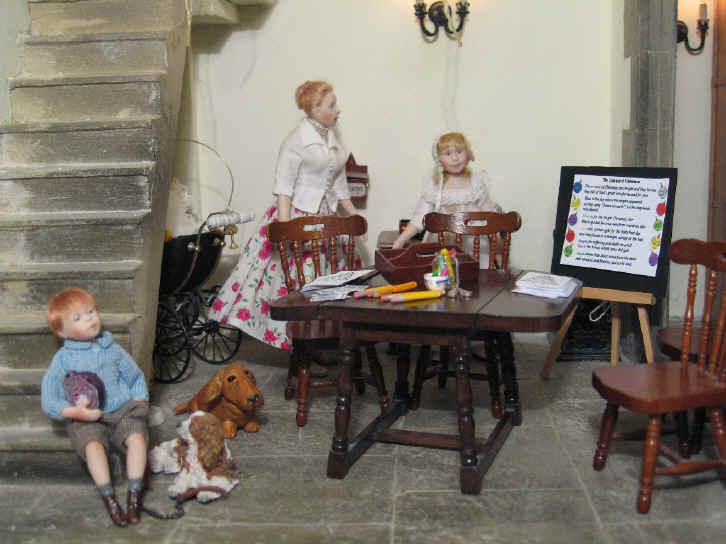 Tinker is trying to catch Emily's attention but Emily is too interested in what the vicar has to say to take any notice of her. 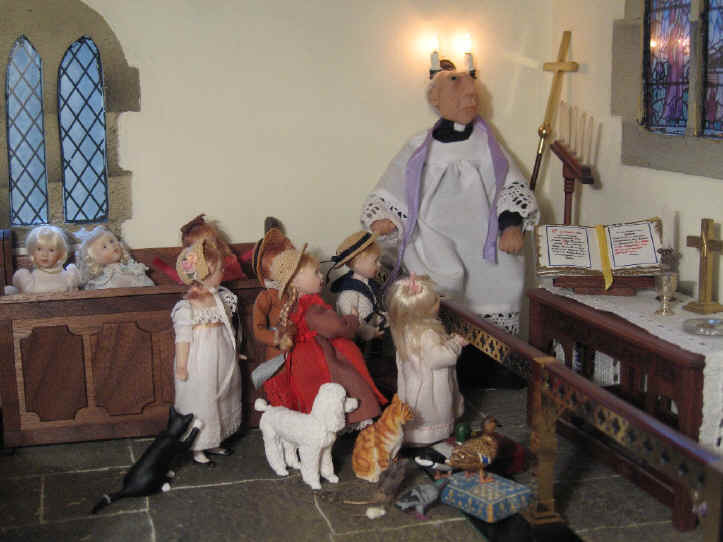 The vicar started to explain about the colour purple and how it is a royal colour to denote that Jesus was a King even though he was born to a poor family and in a stable with animals and hay. The vicar also explained that the colour blue is sometimes used in some churches during Advent as it denotes the sky and how the three kings, or wise men, were guided by the star that led them to Jesus born in Bethlehem. Oh dear........WHAT has happened to poor Esme, the duck? Naughty Robert Alexander has still managed to come into the church late for the vicar's teaching on the colours blue and purple. 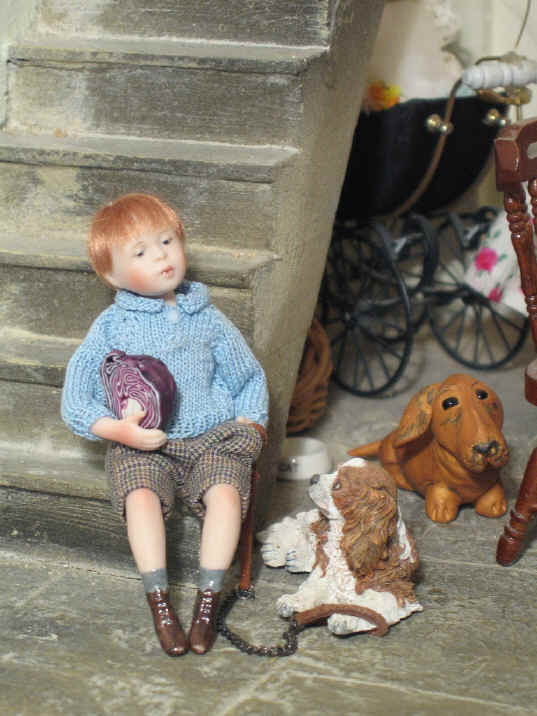 He has also ousted poor Esme off her perch too............and has the cheek to doze off whilst resting on the altar. He is still clutching his "royal" cabbage now he has heard that purple also means "royal"!!! Adele was really keen to see the vicar's purple silk stole so he was kind enough to take it off and let her hold it. She was interested to know now why he wore a purple one during Advent. Tinker is still trying to catch the children's attention! Priscilla Jane and Tom have been allowed into the sanctuary because they promised to be really good! 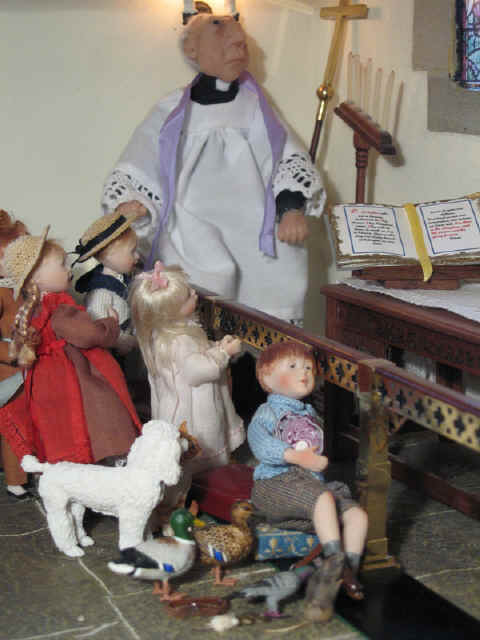 They wanted to look at the embroidered purple hardanger cross on the altar cloth. 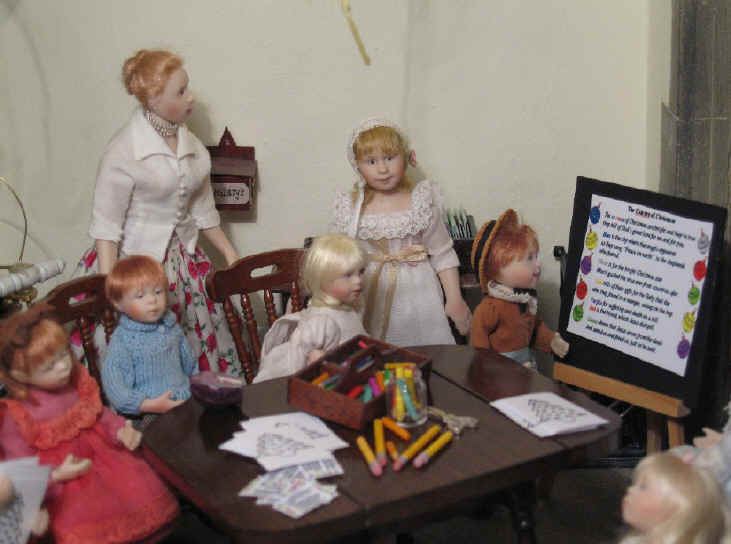 The children are all seated now as Miss Esther draws their attention to the Christmas Colours poem that Alice has pinned up on the blackboard. Ben is most particularly interested to read it as it explains what the colours mean as they prepare for Christmas. Oh dear..........Charles the royal named cabbage has appeared again........it seems that Robert Alexander is not going anywhere without "him"!! Tom has been asked to give out the Christmas tree templates with stars on. These are for those of the Sunday School who want to represent the colour blue. The stars appear in the blue sky! Adele is giving out the Christmas tree template with crowns on to represent the colour purple and royalty. Bardsley and Georgie are most interested to watch all that is going on as you can all see. Something is NOT quite right here? Can anyone see what it is? Oh dear.............again...Robert Alexander has decided to do his own thing. Can you see what he is drawing? He has been VERY naughty and turned the paper over which Tom so carefully gave out to him with a Christmas tree template and drawn his cabbage instead! Ummmmm.......WHAT will the vicar be saying to him when he sees what he has done? Well done Amelia! Amelia is one of the most intellectual of the children in the Sunday School and she prides herself on being able to get everything right! 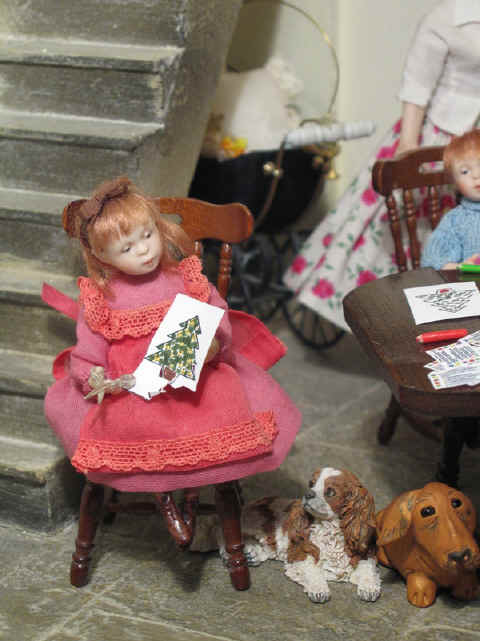 Here you can see she has already coloured in her Christmas tree with crowns on and it busy carefully cutting it out! Georgie is most interested to watch. Robert Alexander must be SO jealous that his dog, Georgie, is not interested in HIS wonderful drawing of a purple cabbage called Charles! 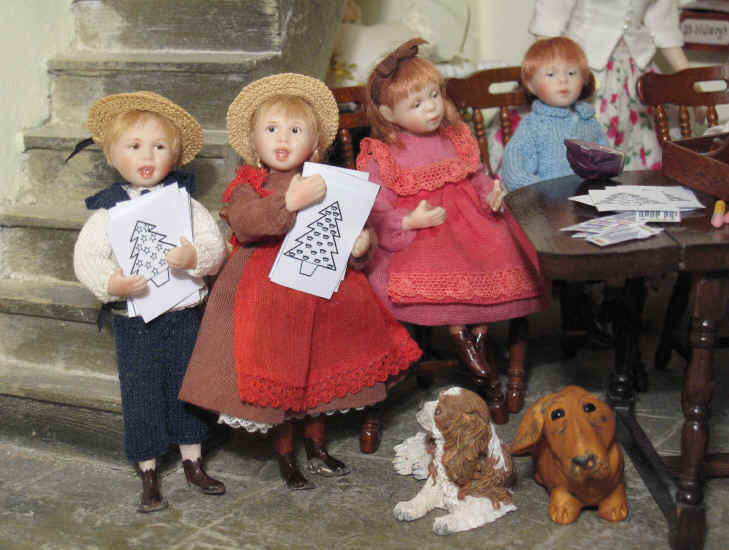 Amelia may have nearly finished her Christmas tree but the other children are just enjoying a relaxing time colouring in and chatting to Miss Esther and Alice about Advent and the soon to arrive, Christmas Day! Miss Lorna Webb's Advent lesson plans can be seen on our Advent page where you can find out more. We have only been able to include elements of her first lesson here by way of example. Thanks to Frances of Buttercup Miniatures for giving us the idea of naming the cabbage. She assured us that her daughter was very happy to name her plants so we felt it was very in keeping with the spirit of St. Hils and were most pleased to add this little nonsense to the story........Thanks also to Catherine Davies, for the wonderful fimo "purple" cabbage! Of course we all know that it is actually called a "red cabbage" - but hey - it looks purple to Robert Alexander and all of his Sunday School chums! Can't find what you want? Try our search facility! Please note: we do not accept link exchange email requests made purely to enhance ratings on Google. Only sites that are both relevant and loved by us will be considered. This site is dedicated to Hilary Doreen Davies who departed this life 26 November 2003 aged 71 after 23 years of chronic illness with strokes, cancer and arthritis. St Hilary's Church is our tribute to a brave lady who was mother to Sarah, Catherine, the late Rachel, the late John and wife to the late Owen Williams Davies.